Then you'd also include Maxine Walters for telling a crowd to hunt down & harass Trump people anytime, anywhere & any number of political commentators & talk show hosts who agreed with her. Regarding your comment about the book & that it won't seem likely that any groups will become empowered to commit violence as a result of what she says, this seems to come awfully close to contradicting an earlier comment of yours. Now you could argue I suppose that the author is not a prominent public figure, but then you'd have to define the term "prominent public figure", which could be quiet difficult. Yes, I certainly would include that. I don't think advocating the harassment of people for their political affiliation should be protected speech. Are there widespread examples of women actually hunting down and attacking men because they're supposedly rapists? If so, then I would say that yes, an environment exists in which the comments are likely to provoke violence. If not, then it's not the same as suggesting violence in an environment where that suggestion is very likely to be followed. The idea that we police people's speech based on what someone that has absolutely nothing to do with them may do after hearing what they have said sounds like an extremely sinister one to me. I know you don't mean it to be. You could use that justification for preventing anyone from saying just about anything you may not like. Not if it's based on a reasonable legal code. But I think we've reached a dead end here, so I'm happy to drop further circling between us. I can see your side, but I don't fully agree with it. Wow, I go away for a few days and this has exploded!!! No, it is not about someone's rights. That is not the idea of my post, apologies if it reads wrong. You can do whatever you want in your personal time, you can go to the pride, to a KKK convention, look for weird videos in the web; I am not going to come in your house and tell you off! Absolutely fine by me, even if I do not personally like some of the activities that other people like (goes without saying!). But on your employers time you are there to do your job, not preach or whatever other message you want to pass. Let's face it; people want to use the popularity of the sports to pass their messages. But I do not agree with that, I am watching F1 to see my favourite sport, not to hear anyone's concerns. I do get my news from the media and I can form my own opinion. I do not need Hamilton to tell me that killing innocent people is bad, nor F1 to let me know that what happened to NZ was a tragedy. Maybe that sounds tough, maybe I'm insensitive, call it what you want. I just do not think that these two things shall be mixed. Yeah I think I'd agree with this. If a person uses a sport to state a position, then they are, however inadvertently, dragging the sport into it. And I don't see how the right of the individual to express themselves trumps the sport's governing body's right to stay impartial. It's the same as the FA not allowing political slogans on team shirts, etc. "Lewis Hamilton ‘cannot win titles on the back of abuses’"
How is this a result? If anything, this is a result of F1 trying to ignore the political reality of countries it races in, not the opposite. This is the result of what happens if they try to mix politics with a sport. They are trying to get F1 involved with these comments, they want to use F1 as the means to gain attention to whatever cause. Supporting a cause is not a bad thing obviously. But to go to the length of "Lewis is winning titles on the back of abuses" is a bit too much. I'm happy for F1 not to get involved in anything other than pure sport. Exactly that. That's what Mikey was trying to convey as well. Where do you put a stop? You either do everything or nothing. And there are many many many countries with dirty laundry and so many shady things happening around the world that it would be a true Pandora's box as you mentioned. I doubt we visit a single country that does not have social or ethical issues F1 could be barracked into addressing. Just as footnote to the hate speech debate in this thread, this is an example of how so called "hate speech" by sportsmen is addressed in Australia. 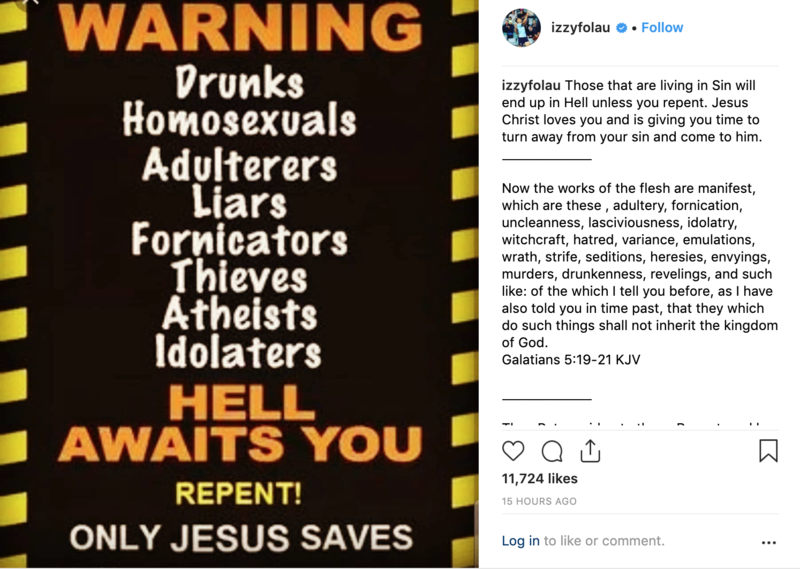 Israel Folau, a current Rugby international player for Australia & devout Christian, looks like he will have his contract terminated with Rugby Australia due to this heinous post he placed on Twitter. Now while I personally believe the post was just plain dumb, I find it reprehensible he's about to lose his career for voicing his religious beliefs, as narrow minded & misguided as they may be, on his own time away from his representative duties. As someone who it seems, according to Israel, is also destined to spend eternity hanging with beelzebub for my belief, or should I say lack thereof, I really couldn't give a frogs fat one what he says & instead of people getting all offended & triggered by ramblings of someone who really is so inconsequential to their day to day lives, maybe people need to take the rubbish he posted with the grain of salt it deserves, have a chuckle to themselves & move on with their lives. I wouldn't even classify what he posted as "hate speech". He was expressing his religious beliefs & anyone familiar with the books of the Abrahamic faiths will know that is exactly what those books indicate. This guys about to lose his career not because he said he hated a certain category of people or anything like that. He was simply expressing his religious beliefs in line with what his faith prescribes. People are screaming that his tweet anti gay, homo-phobic & hate speech. I'm sorry but that's crap. It was wrong & it was dumb but it was not hate speech. This is just another example of the PC brigade in Australia with their lynch mob mentality who've seen an opportunity to yet again demonstrate how virtuous they are by claiming their pound of flesh & throwing yet another person who dares not sing from the same song book to the wolves. I'm sorry but this stuff really craps me. I don't know if the social media age has done this or what but people really need to stop being so pretentious & fragile when it comes to what other people say & instead of getting all full of rage & vindication when someone says something that goes against how they believe the world should be, just learn to treat it with the contempt it deserves & move on. BTW- I noticed everyone's calling it an anti-gay & homophobic post. Where's those people defending us adulterers, drunks, liars, fornicators, thieves, atheists & idolaters? Where's everyone defending us? Obviously no-ones interested if we're hurt by his remarks or go to hell. Personally, as a drunk, an atheist and an unfortunately occasional fornicator I can confirm I am not offended. Is it unfortunate because you wish you didn't fornicate mikey or that you fornicate only occasionally? This is the problem though. In this modern PC world we live in, there is not much you can do or say without someone getting offended about something. And for me, the crucial thing is that people DO take offence. They take offence for any minor thing that has 0 effect on their daily lives as you mention above. In the past someone spewing this kind of thoughts would be just ignored, maybe teased a bit and then life would go on. Now the new age keyboard warriors will take offence and riot against this poor guy that made the mistake to express his views. As silly as they sound to others. Why do you have to do everything or nothing? There are only finite time and resources to get involved in these things so it could be argued that it is acceptable to tackle some issues and not others due to this line of reasoning. Does a person that is 'good' do every single possible thing good that they can, or do they just do a reasonable amount of 'good', and more than most people? “It's now very common to hear people say, 'I'm rather offended by that.' As if that gives them certain rights. It's actually nothing more... than a whine. 'I find that offensive.' It has no meaning; it has no purpose; it has no reason to be respected as a phrase. 'I am offended by that.' Well, so f***ing what." "Hey buddy. Come here. Hey, Mr. Comedian. Come here. Hey buddy, we're Christians. We don't like what you said." I said "then forgive me"
But who will be the judge of that? Is your tragedy bigger than mine? Is there a tragic-o-meter? Is there a way to check and approve what political message to pass in F1? Ok, F1 is covering this earthquake today, NBA can do the tsunami next week? If people see sports as the platform to pass any political or social messages, then there will be no end to what messages they will want to pass. Again, see how Turkey tried to pass a political message in that podium. Because if you do none, you're not taking a stance for or against and can lay claim to being neutral. If however you do one then any that you reject after that becomes a political statement, that you either don't agree with the cause or don't think it important enough. And that exposes F1 to all kinds of extra criticism and unwanted attention. Or you didn't get involved in the latter issue due to a lack of time and/or resources. If a person or organisation does one thing good, are they then committed to doing all things good or risk being labelled as being biased and unfair? Why can't we just praise them for the few good things that they have time and opportunity to do instead of focusing on all the things they haven't done? The BIG problem though Jezza is that he is losing his contract because he made similar comments last year and they were unpunished. He is in the public eye, was warned yet he still persists. He is using his position to propagate bigotry. Sorry but he deserves it. I don't believe anyone should lose their job because of their religious beliefs. It's pandering to the masses. It shouldn't make any difference to anyone if he thinks certain groups will go to hell. Big deal. It's not like he has the power to actually make that happen and he should be treated like any crackpot and any such ravings laughed off. Because what Zoue describes will get out of hand. Take the article I posted above about Hamilton being accused of winning titles on the back of abuses. "Lewis, is it appropriate to earn millions of pounds and stand on a podium that could be on the back of Najah? Less than 24km away somebody is in prison being abused. You, Lewis, have a moral responsibility if your leadership will not take it." You want to tell me that Hamilton or any other driver should be dragged into any political/social games like that? Does this make sense to you? The issue is that he is associating Australian rugby with that belief, they have to do something to distance themselves as a sporting group from those sentiments. They tried last year and there was an incident prior to last year and neither of those was sanctioned. Ask yourself why aren't F1 drivers political, pretty sure the reason will be in their contracts associated with bringing the team and F1 into disrepute! Well I've only seen the one tweet and from that I don't see any association with rugby tbh. He's expressing his personal views and as silly as they may sound they are still his to express. I get what you are saying as the reason why, I'm just saying I think it's a little sad that that kind of attitude exists in business. The reality of it is that they probably had to do it as otherwise they'd get the lynch mobs baying for blood, but ultimately I think it's a sad indictment of today's society that such twitter justice can be meted out. It's mob rule, unfortunately. His post has nothing to do with Rugby and nobody would think it is approved by Australian Rugby. Thing is by "doing something" here every time they ignore anything going forward it will look like they approve of it. Sorry gents that is simply plain nonsense, Israel Folau is one of the superstars of Australian and World rugby, that is similar to saying that if Vettel or Hamilton or Verstappen post on SM that it would not reflect on F1. Folau, Kurtley Beale and David Pocock are Australian Rugby and of those Irsael Folau stands out as its not only Rugby Union but Rugby League! It's the way the world works today with instant access to everything, but it doesn't make it right. Private thoughts shouldn't reflect on the sport. Would any reasonable person consider the entire sport of Australian rugby to be in agreement with Israel? His opinions are his opinions, they dont have any bearing on how good of a rugby player he is and that is the only criteria I think the league should be judged on. I think he's a fool and that he should mind his own damn business but my opinion of the rugby leagues he plays in wont be diminished if he continues to play. In fact to the contrary my opinion of those leagues will be severely diminished if he is stopped from playing for his opinions. It has nothing to do with his ability, but as a senior player he might well be seen as representing the sport. Its telling that he has not in any way stated these are his personal opinions to isolate himself from his teammates, he has had a considerable time to do so. Rugby Union is a sport that is in my view considerably less homophobic than many, top players are open about their sexuality and its top ref is also gay. There are entire teams that are gay who compete without issue. Compare that to football/soccer where homophobic abuse from fans is common, in addition to racism. Many of his team mates will not want to be associated with his views, Australian Rugby has decided that if he can't keep his personal views to himself then enough is enough. Finally posting on instagram is a very public way of expressing his views, when you do that your views and opinions become public. I dont really follow the logic of your 1st and 3rd paragraphs. Why would anyone assume his teammates, or anyone else, agree with him? Surely the default position is to assume that his opinions are his alone, unless we have reason to think otherwise. Also while I dont see why anyone would associate them with his views in the first place, they are more than free to say 'I dont agree' if they want to make that clear.